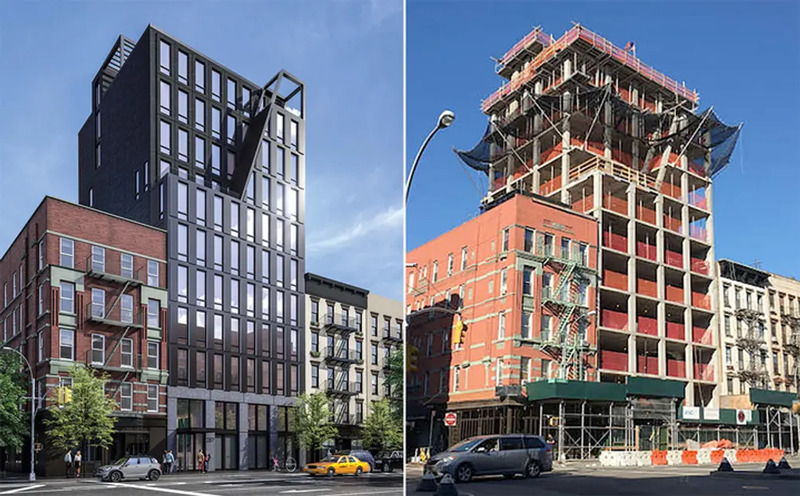 287 East Houston Street, a forthcoming Lower East Side condo has officially topped out and celebrated the milestone accordingly at the Clinton Street Baking Co. yesterday afternoon. There, the team provided tours of accessible parts of the building that included the entryway and what will become an apartment on the 8th floor. Each of the building’s 28 units will boast 10’ ceilings, floor-to-ceiling windows and Meile washers/dryers in a separate closet space. The kitchens will be fitted with custom Italian cabinetry by Alta, lacquer cabinets, and a honed Cararra marble countertop and backsplash. Miele integrated kitchen appliances will be found throughout, and the maisonette and penthouse owners will be treated to sub-zero wine refrigerators. The bathrooms will be equally impressive, with honed Bianco Domolti marble tile walls and radiant floor heating supplied by NuHeat. Minus the Toto toilet, Grohe provides all of the bathroom’s hardware. 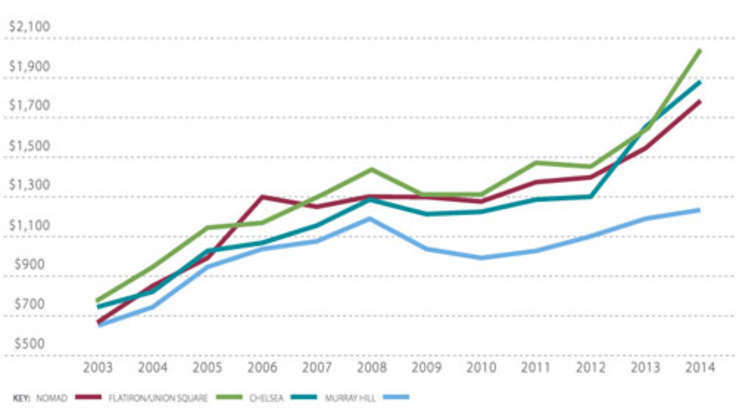 Since we last checked in on 287 East Houston, 5 of the homes have fallen into contract. Currently available are 3 one-bedrooms starting at $1.15 million, and 4 two-bedrooms starting at $2.7 million. One of the units is “Maisonette B,” a ground-floor 2-bedroom, 2.5 bath with a terrace as well as a private garden. The building, designed by AA Studio with Jeffrey Cole as the chief architect, makes a statement as one of the few high-rise properties in the neighborhood. Its distinctive, dark grey façade gives it a bit of a foreboding effect. Our architecture critic, Carter B. Horsley, likened the façade to the “dark magnificence” of Darth Vader in his review of the property. AA Studio cites the classic cast iron buildings once found all over the Lower East Side as its true inspiration. 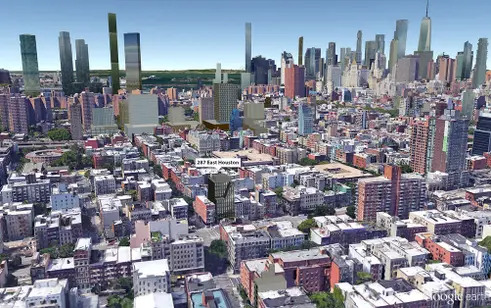 With much of the neighborhood zoned for lower building or landmark, the impeccable views from 287 East Houston, from heights as low as the 7th story, are mostly here to stay. Be sure to check out CityRealty’s 287 East Houston profile for more details including listings, amenities and the full building review. Contributor Julian McBride Julian is a Content Intern at CityRealty and a contributing writer for Market Insight. He's a native New Yorker and attends Brown University.